Zero Mostel began his career as a comedian in 1941, and in 1943 he was described in Life magazine as "just about the funniest American now living." Mostel was blacklisted by the House Un-American Activities Committee in 1952. 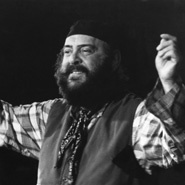 During the 1960s, Mostel turned to Broadway. He is best known for the Broadway plays A Funny Thing Happened on the Way to the Forum (1962) and Fiddler on the Roof (1964), in which he played Tevye. He won Tony and Obie Awards for his stage performances. He memorably showcased his wide range of talents in Mel Brooks' 1968 film The Producers.